St Paul's Cathedral dedicated to Paul the Apostle dates back to the original church on this site, founded in AD 604. The present cathedral, dating from the late 17th century, was designed in the English Baroque style by Sir Christopher Wren. Its construction, completed in Wren's lifetime, was part of a major rebuilding programme in the City after the Great Fire of London. The cathedral is one of the most famous and most recognisable sights of London. Its dome, framed by the spires of Wren's City churches, dominated the skyline for 300 years. At 365 feet (111 m) high, it was the tallest building in London from 1710 to 1967. The dome is among the highest in the world. 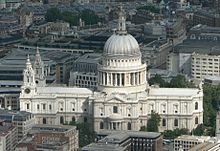 St Paul's is the second-largest church building in area in the United Kingdom after Liverpool Cathedral. This article uses material from the Wikipedia article "St Paul's Cathedral", which is released under the Creative Commons Attribution-Share-Alike 3.0 License.